Campaign for the American Reader: Pg. 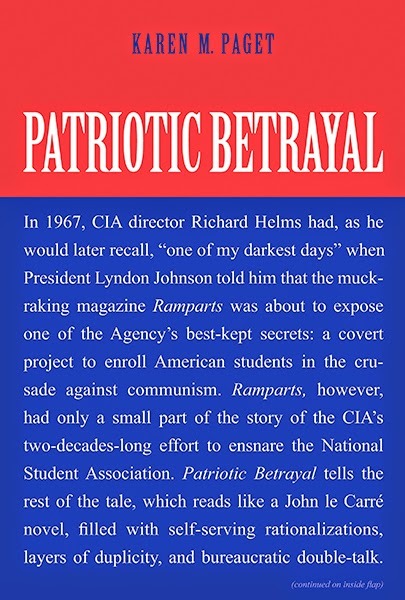 99: Karen M. Paget's "Patriotic Betrayal"
Featured at the Page 99 Test: Patriotic Betrayal: The Inside Story of the CIA’s Secret Campaign to Enroll American Students in the Crusade Against Communism by Karen M. Paget. A cautionary tale, throwing sharp light on the persistent argument, heard even now, about whether America’s national-security interests can be advanced by skullduggery and deception, Patriotic Betrayal, says Karl E. Meyer, a former editorial board member of the New York Times and The Washington Post, evokes “the aura of a John le Carré novel with its self-serving rationalizations, its layers of duplicity, and its bureaucratic doubletalk.” And Hugh Wilford, author of The Mighty Wurlitzer: How the CIA Played America, calls Patriotic Betrayal “extremely valuable as a case study of relations between the CIA and one of its front groups, greatly extending and enriching our knowledge and understanding of the complex dynamics involved in such covert, state-private relationships; it offers a fascinating portrayal of post-World War II U.S. political culture in microcosm." Visit Karen M. Paget's website. The Page 99 Test: Patriotic Betrayal.